If you like the relaxed, easy-going decor of coastal living or beach cottage style, and need a little inspiration to get started in decorating your bedroom, here are some great ideas on furniture sets, bedding, and accessories. Remember, however: just because you are decorating with a theme doesn’t mean that EVERYTHING in the room has to match. Stick with just a few touches of the coast to avoid overload. Covering your bed with a coastal, beach or ocean-inspired bedding set is one of the easiest ways to give your bedroom nautical flair. In a child’s ocean-themed bedroom, go all-out with bedding covered in brightly colored fish, seashells, ocean creatures, boats or mermaids. 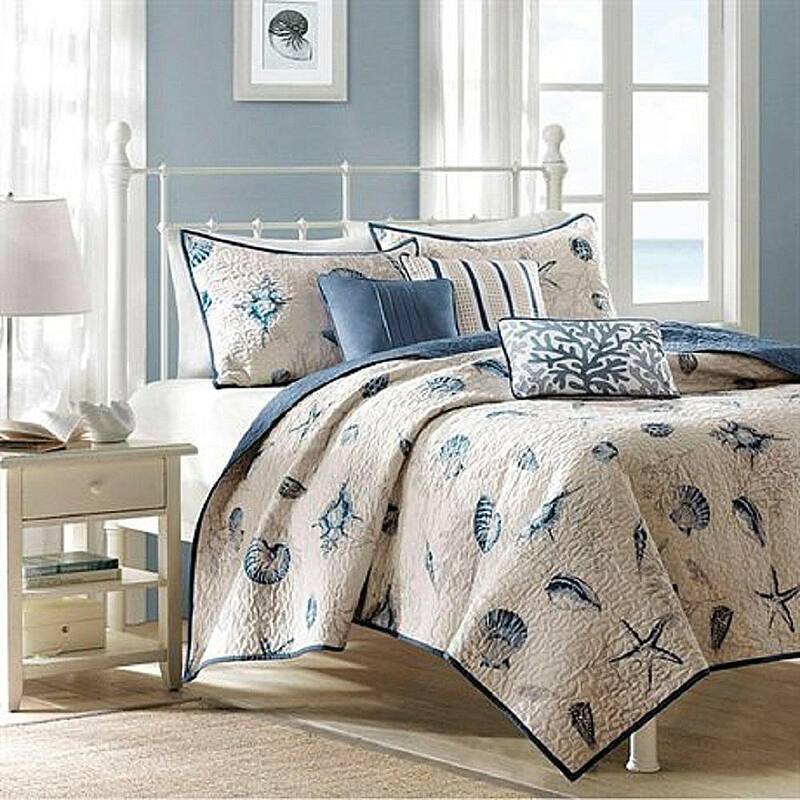 In the master bedroom, keep the look mature with bedding that celebrates coastal motifs such as anchors, waves, boats, sails, shells or sea life, yet isn’t too brash or tacky. Or, if you prefer a more subtle touch, choose bedding with bold stripes -- a classic coastal design. Maybe an entire coastal-themed bedding set is too much for your tastes, but you still want to bring a taste of the beach to your bedroom. In that case, stick with solid or striped bedding, but top it off with a nautical throw blanket tossed across the foot of the bed. Plus, you'll have a handy blanket to warm your shoulders while reading in bed. There are many furniture lines that sell coastal living styles; one of the most popular is from Stanley Furniture and called "Coastal Living Resort." Many of the pieces come in white, which is a coastal-style classic, but there are many other finishes available in natural wood and soft pastels. Casual, easy and breezy, Coastal Living Resort furniture is not only perfect in the beach or coast-themed bedroom; it’s also a winner with any casual decorating theme. Add a few throw pillows to your bed, and you have an instant update. Any coastal design will work: anchors, sea life, coral or seaweed, shells, boats, sails, nautical rope, seabirds or shoreline are all possibilities. To keep the look sophisticated, mix a pillow with a nautical design with a couple of striped pillows. In a child’s room, have fun with fanciful beach motifs. Every bed needs a bedside lamp, so why not celebrate the coast with a lamp fancifully designed as coral, a shell, a piece of driftwood or even a sailing ship? In a child's beach bedroom, go even further with a mermaid lamp or a super-colorful fish or sea life design. Window treatments used in the coastal living style are layered; for example, a window may have white silhouette blinds paired with cascading drapes and/or a valance. The most popular treatments layered in this style are white shutters, fabric cornices, valances, and pull-up shades. The fabric patterns for these window treatments consist of simple motifs, often solid colors or striped patterns. When decorating your bedroom in the coastal living style, choose just a few purely decorative accents to add some whimsy and personality to your room. Vintage signs, paintings or prints, seashell collections, collectibles, life preservers or even antique oars are all possibilities to consider. In a child’s room, have fun with vintage beach pails and their shovels, stuffed animals, seashells, bright and whimsical ocean collectibles, popular ocean animated characters or wall posters. You’ll find a nearly endless choice of suitable accessories in stores like HomeGoods or online at Amazon.com.